We’re just one week into the New Year and here I am sharing a pizza recipe. It seems like most people, myself included, are looking to take our diets in a healthier direction this time of year, and I usually don’t think of pizza as being healthy. This pizza is another story. It’s probably the healthiest pizza I’ve ever made, loaded with veggies and totally vegan. It’s also over-the-top delicious. I’ve created a few vegan pizzas at this point, and I think I’ve figured out the key, which is really the same rule I apply when veganizing any recipe: if you can’t create a vegan version of something that’s as tasty as the original and relatively easy to create, don’t even try. Most pizza is covered with a layer of mozzarella cheese. Melty, stretchy cheese is not among those easy to replicate vegan foods. I’m not saying it can’t be done, but you might need to seek out some ingredients you don’t have on hand and will never use again. You might have to do some back and forth with heating and refrigeration steps. You might devote a good portion of your day to it. Whenever this is the case, I simply go with plan B, which is to find a replacement that’s relatively easy to make, and at least as delicious as the original. In this case hummus was my ingredient. I’ve seen hummus used in pizza recipes a few times, and at first I thought it sounded a little weird. It was actually perfect though. The awesome thing about hummus is that it functions like cheese and sauce. It adds richness, flavor and bulk like cheese, while providing a nice base layer over your crust like sauce does. White bean hummus works especially well for this, since it blends up nice and creamy. This hummus pizza was also the easiest pizza I’ve ever made. 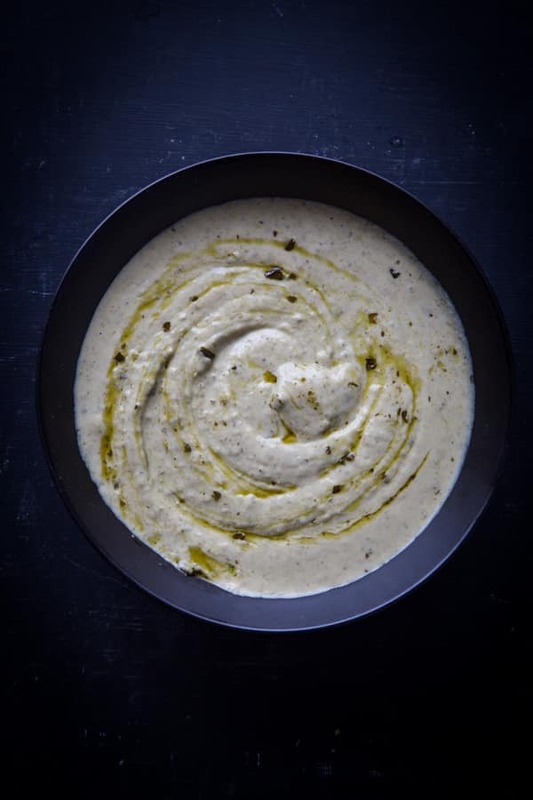 Everything happens simultaneously — the crust bakes and veggies roast while you blend up the white bean pesto hummus, which is extra easy to whip up given the fact that most of the flavors are already conveniently packed into the pesto. You can use store bought or homemade prepared pesto, but keep in mind that most store bought pesto brands contain Parmesan cheese, so they’re not vegan. Amore is one brand that’s available in lots of supermarkets and online. You could also make your own. This vegan pizza is flavorful and hearty, with a layer of creamy white bean pesto hummus topped with roasted broccoli, mushrooms and zucchini. It’s as easy to make as it is healthy, and takes just 30 minutes to prepare. Preheat the oven to 400º. Place a pizza stone or baking sheet in the oven to preheat. Place veggies in a roasting pan with 2 tablespoons of olive oil, salt and pepper. Toss a few times until the veggies are evenly coated. On lightly floured surface, roll the pizza dough into a 12- to 14-inch circle. Brush the top with the remaining 1 tablespoon of olive oil. Carefully transfer the dough to the preheated pizza stone or baking sheet. Place the veggies and pizza crust in the oven. Bake the pizza crust until lightly browned, about 15-20 minutes. Bake the veggies until slightly tender and browned in spots, about 20 minutes, tossing 1-2 times during baking. Place the beans, pesto and lemon juice into bowl of food processor fitted with the S-blade. Blend until smooth, stopping to scrape down the sides of the bowl as needed. Season with salt to taste. Spread the white bean pesto hummus in an even layer over the pizza crust. Arrange the veggies on top, cut into slices and serve. Feel free to substitute your favorite veggies. Bell peppers, diced eggplant, and artichoke hearts would all be delicious here. You will need a total of 6 cups of whatever veggies you choose. This pizza is totally my kind of thing! I am a huge fan of hummus but I’ve only tried it on pizza once. I need this! Pinned! White pizza of any kind might be my favorite ever. Stroke of genius with the add of hummus! There’s a white bean pesto hummus at trader joe’s that is DELICIOUS for those looking for even less prep time. This is pretty similar to the Trader Joe’s hummus. I don’t think that one is vegan, but it would be a good option for anyone not sticking to a vegan diet. Thanks for the suggestion! Oh sweet mother of all that is good and holy. White bean pesto hummus on PIZZA?!! Sign. me. up. I need to make this ASAP. I love the idea of swapping cheese with hummus, that’s brilliant! It really did work out nicely. Thanks Laura! I’ll take that as a good sign. 😉 Thanks Jane! Hummus on pizza is my favorite! I agree, if you can’t make something vegan that is just as good, juuuuust don’t even with that. It really is a great combination! I hope you enjoy it! This looks absolutely fantastic, Alissa! I’ve never made a vegan pizza. I can’t wait to try it out! Thanks Liz! This is a great way to try out vegan pizza. Hope you enjoy it! Don’t get me wrong, I love crazy melty stringy cheese…but my body doesn’t. Trying to be healthier lately and this pizza is totally calling my name! SO delicious! Definitely making this instead of cheese and tomato based pizzas from now on. So glad to hear it! Thanks Laura!